Beenarourke is the 1146th highest place in Ireland. Beenarourke has two high points on its summit about 100 metres apart, which are similar in height. This photo was taken from the northerly summit looking to the rocky spine of the southerly summit. The best views are from the rocky spine, where Deenish and Scarriff Islands loom large in the expanse of the Atlantic ahead. 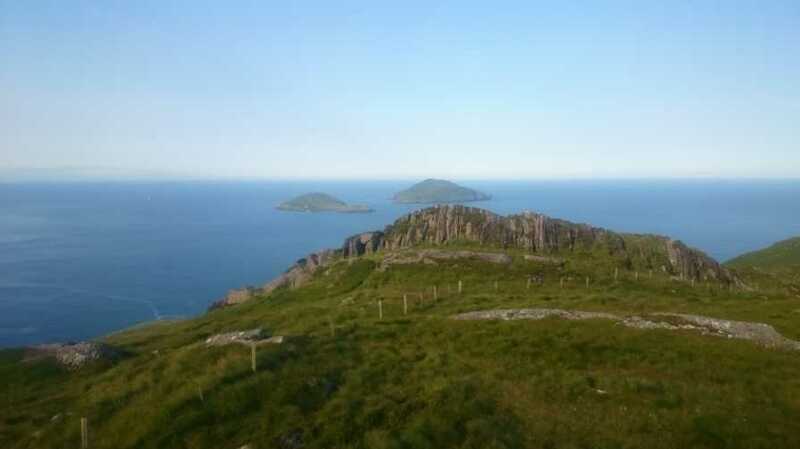 The views are fine across Ballinskelligs Bay to Bolus Head and out to the Skellig Islands. Abbey Island and the small Eagle Hill peninsula are to the southeast, while across the N70 below, the steep bulk of the Farraniaragh and Cahernageeha hills provides a dramatic backdrop to this area of the Ring of Kerry.